Thousands of cheering, stamping, whooping fans. Pounding dance music. Slickly produced and edited videos. Dry ice machines. Spotlights sweeping across a stage. Giant screens hanging overhead. This is not a surprise PA at a nightclub by a boy band. This is not the launch of a blockbuster movie or a car. This is Minecon - the global convention for the players and creators of Minecraft - a video game set in a world made of blocks that, in just a couple of years, has become a worldwide sensation. 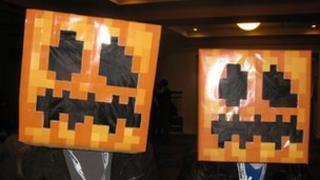 Rough industry estimates suggest the PC version of Minecraft has sold about eight million copies. But that estimate does not take into account the many who play it in on the Xbox 360, iPhones, Android handsets, on Kindles or on a growing number of other devices. All in all, the global community involved with Minecraft is thought to be about 40 million strong. "Freedom," said gamer Erik Christiansen, (known when he plays Minecraft as Torencresent). "You can do whatever you want in the game." And people do many different things. Some build palaces, giant sculptures or recreate real world places using Minecraft blocks. Others use the materials in the world to make crude blocky machines and devices. And, added Mr Christiansen, if what you wanted to do was not there you can create a modification - or mod - that does the job, and then you can share that with other players so millions of others can do what you did. He said some of the improvements players suggested also made it into the game's core code. That virtuous feedback loop from fans to game and back again is almost unprecedented, he said, and has only helped turn it into a huge hit. Minecon, held at Disneyland Paris in 2012, is where the game's 4,500 biggest fans gathered to meet the other faithful, see in person friends they only know via the game, dress like the creatures and people found in the game and see and talk to Minecraft's creators. "They are stars," said Danny Gelder (aka Nyloch in game), an avid player who runs a Minecraft server for himself and a few friends. It is hard to disagree given the reaction the game's developers and curators get when they walk out on stage during the opening ceremony. They look slightly overawed as they blink and grin under a barrage of flash photography. The biggest cheer is for Markus Persson aka Notch, the unassuming programmer who coded the original game then put it online for free for others to try while he worked on improving it. "When I started out making the game it was going to be a six-month project." he told the BBC later, taking a few moments to sip coffee, sit back and relax backstage. During Minecon those moments of quiet are few and far between. It is impossible for him to take more than a few steps before someone asks him to pose for a photograph, thrusts forward a poster or flyer to sign or raises a hand for a high five. And, he has to admit, even he is surprised and amazed by the game's success. "I was hoping to see if I could make enough money to make another game - that was the dream goal of it," he said, "but it just kept growing and exploding, thanks to the community,"
And his surprise is not just at the number of copies sold but also at the vast community it has spawned. "There are people who are making a living making things and content for Minecraft which is just amazing to think about," he said. Some of those other people are also stars at Minecon - these are the fans who have gained a reputation for creating amazing things out of the game's blocks, have made YouTube videos that millions have seen, coded mods, skins or other add-ons that millions use or have produced custom-built maps that others play on. They are far better known by their game and web alter egos (Vareide, CaptainSparklez and SethBling to name but a few) than by their real names. They too get a deafening reception when they are introduced on stage. They too are so well known that they are regularly stopped for an autograph or photo op as they make their way between the conference halls at the show. Lydia Winters, who oversees the links between Mojang, the company that makes Minecraft, and its players, said the community gave the game its real strength. "The community, the things that they come up with, are actually far beyond anything we could expect or understand," she said. The fans are also here to hear about what's to come in the game. The next big update for the game, due in January, will tidy up the code that supports a Minecraft resource known as Redstone. Applied in the right way to Minecraft blocks, it helps to form crude electrical circuits and helps to power lots of ingenious devices. The update will make Redstone even more useful and allow it to be used to create a wider range of circuit components. There's also talk about getting Minecraft running on the bare-bones Raspberry Pi computer. Code to do just that is ready now. That means anyone that owns a Pi can load up the game and take it round to their friends where it can be hooked up to another similar machine for an impromptu multiplayer gaming session. There are also lots of sessions where fans can get advice about running their own server, creating custom maps and creating videos of what they get up to in game. There are also sessions on using Minecraft in serious settings. Already it is being used in schools as a way to teach all kinds of subjects, everything from programming to geology to geo-politics. Stephen Reid, an educational consultant who uses Minecraft in schools, said it was a success in the classroom for the same reasons it is so popular with gamers. "It's mainly about the process of creation and people love to create," he said. "As human beings we consistently try to do better, we consistently try to build and succeed, And Minecraft is exactly like that."